Opened Box Return — product is brand new and unused, but packaging may have signs of use. Note: This handguard only works with triangular handguard caps on mid-length rifles. 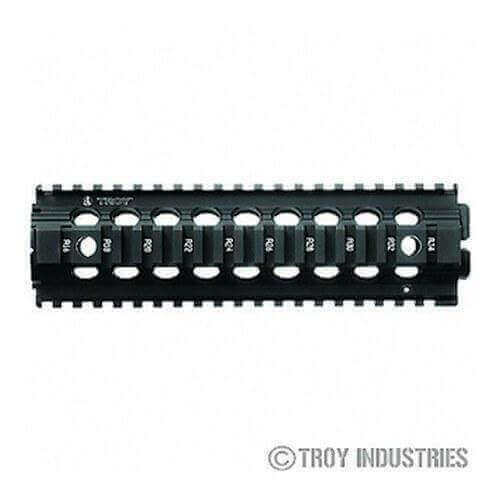 Troy 9″ Mid-Length AR-15 Drop-In Rail Black. The Troy Drop In Mid Length BattleRail is a non free floating direct replacement for all AR-15/M4/M16 carbine plastic hand guards utilizing the mid length gas system. The Troy Patented clamping design ensures a solid mounting platform. The Drop In Mid Length BattleRail provides a true optical mounting platform that increases the modularity and accuracy of the M4.